Alvarez LA1, Kovačič L2, Rodríguez J3, Gosemann JH1, Kubica M2, Pircalabioru GG2, Friedmacher F1, Cean A4, Ghişe A4, Sărăndan MB4, Puri P1, Daff S5, Plettner E6, von Kriegsheim A3, Bourke B7, Knaus UG7, NADPH oxidase-derived H2O2 subverts pathogen signaling by oxidative phosphotyrosine conversion to PB-DOPA. Proc Natl Acad Sci U S A. 2016 Sep 13;113(37):10406-11. doi: 10.1073/pnas.1605443113. Epub 2016 Aug 25. 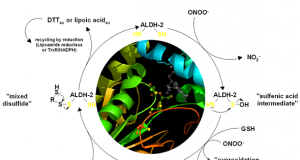 NADPH oxidase-derived H2O2 subverts pathogen signaling by oxidative phosphotyrosine conversion to PB-DOPA. Alvarez LA1, Kovačič L2, Rodríguez J3, Gosemann JH1, Kubica M2, Pircalabioru GG2, Friedmacher F1, Cean A4, Ghişe A4, Sărăndan MB4, Puri P1, Daff S5, Plettner E6, von Kriegsheim A3, Bourke B7, Knaus UG7. Zhang X1, Soldati T1, Of Amoebae and Men: Extracellular DNA Traps as an Ancient Cell-Intrinsic Defense Mechanism. Front Immunol. 2016 Jul 8;7:269. doi: 10.3389/fimmu.2016.00269. eCollection 2016. Of Amoebae and Men: Extracellular DNA Traps as an Ancient Cell-Intrinsic Defense Mechanism. Zhang X1, Soldati T1.